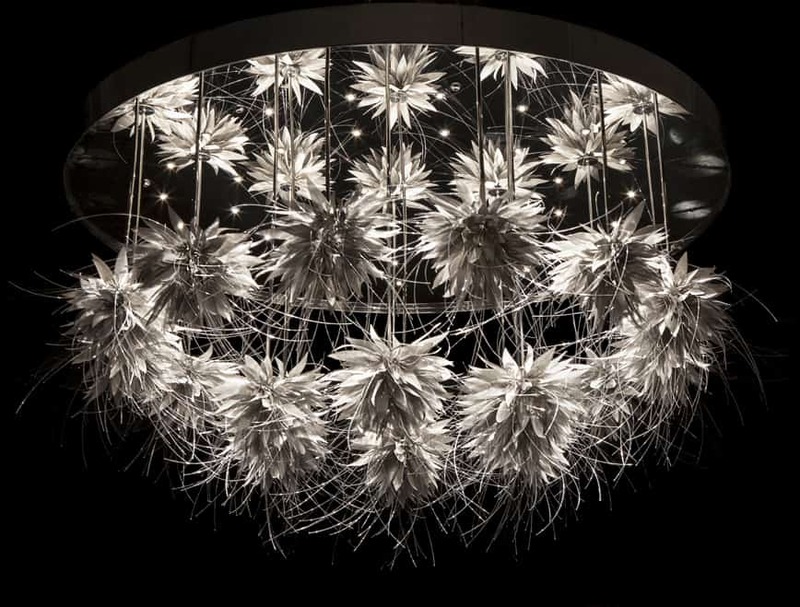 Designer lighting by Sharon Marsten has that WOW factor – no question. The UK designer has really pioneered the use of fiber optic technology in high-end lighting fixtures and displays. 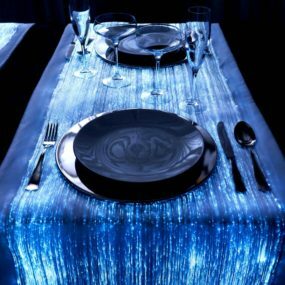 Particularly with her use of end emitting fiber optics. It gives her stunning lighting a magical quality. 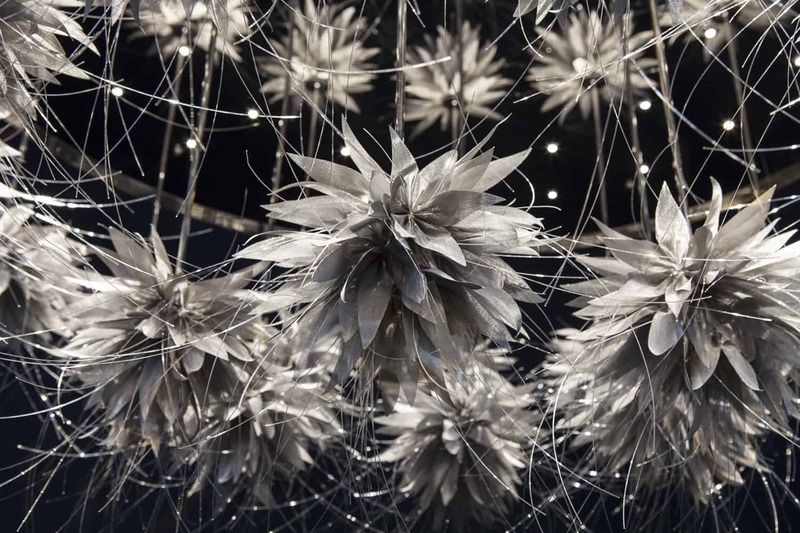 Mixed with copper or other metal mesh pieces, mixed with nylon, mixed with metals – the sky is the limit and her creations are sensational. 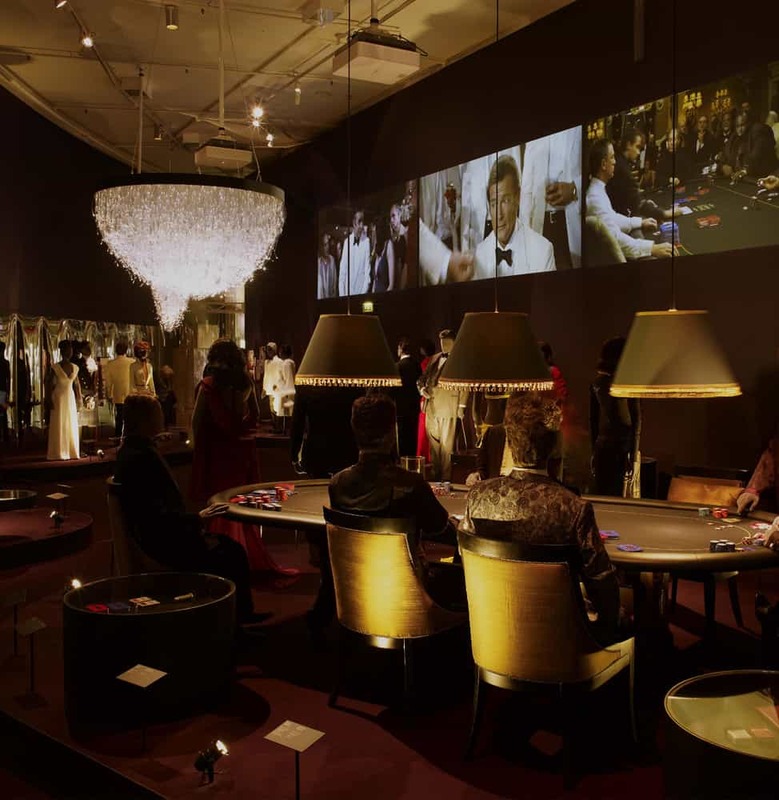 Many are in public buildings, hotels, casinos and museums. 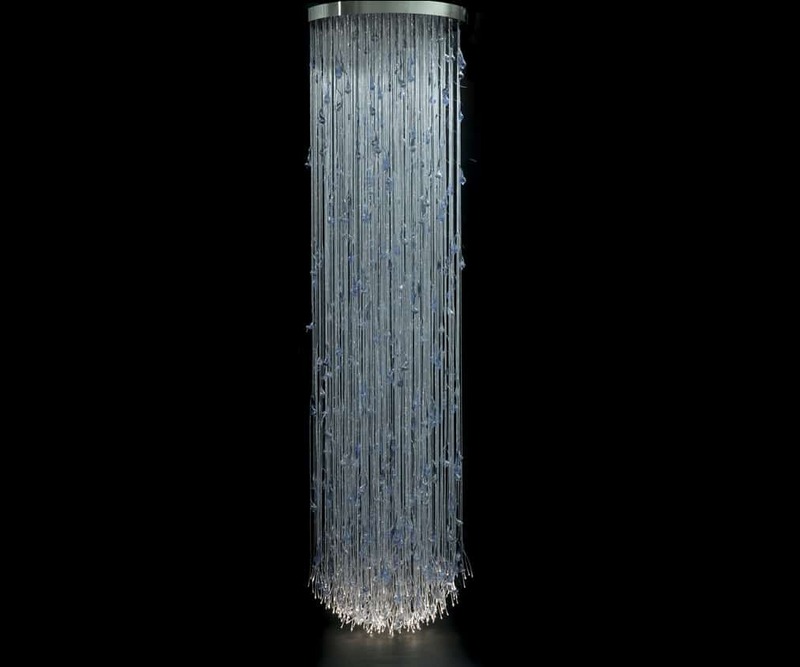 But many are in private residences and she’s happy to design a custom piece to fit your space. Her signature is a long flowing hanging lights and chandeliers, but she can design them to any length. She also does wall mount and ceiling mount styles. 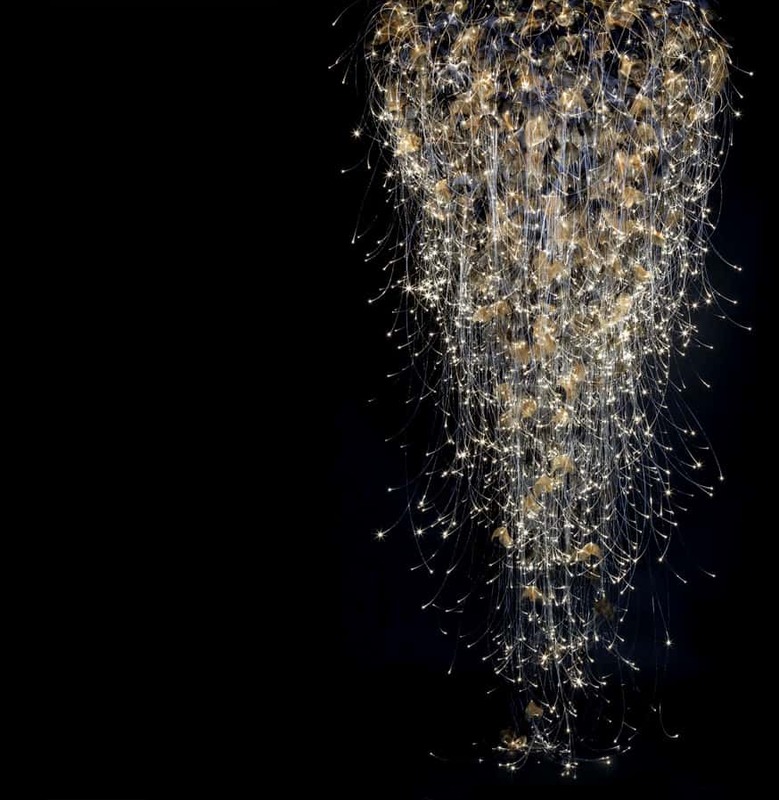 And sometimes, even floor lamps. 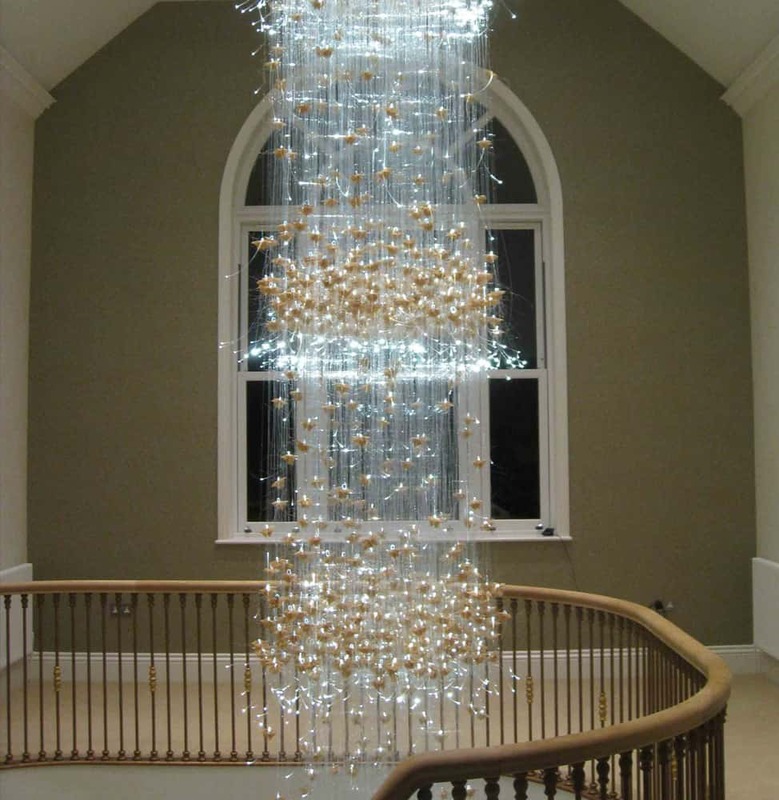 We’ve chosen some of her most creative lighting displays for you below. 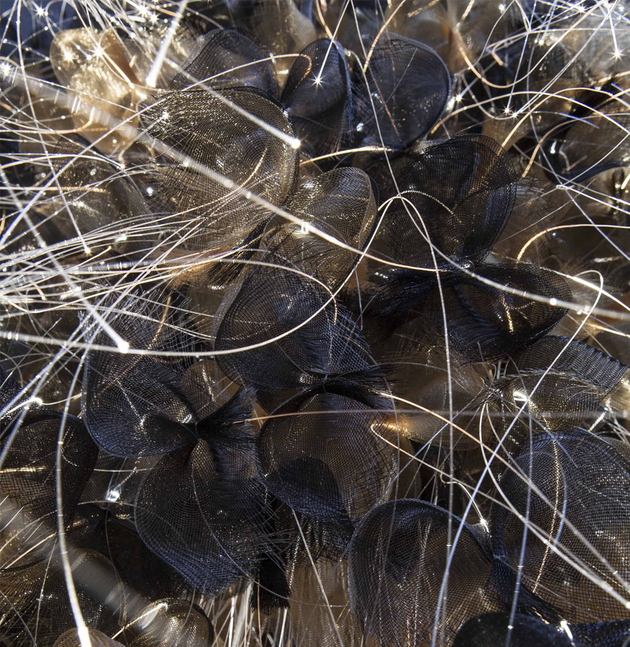 The April/Autumn light fixture has side emitting strands which scatter flecks of light the full length of the piece. 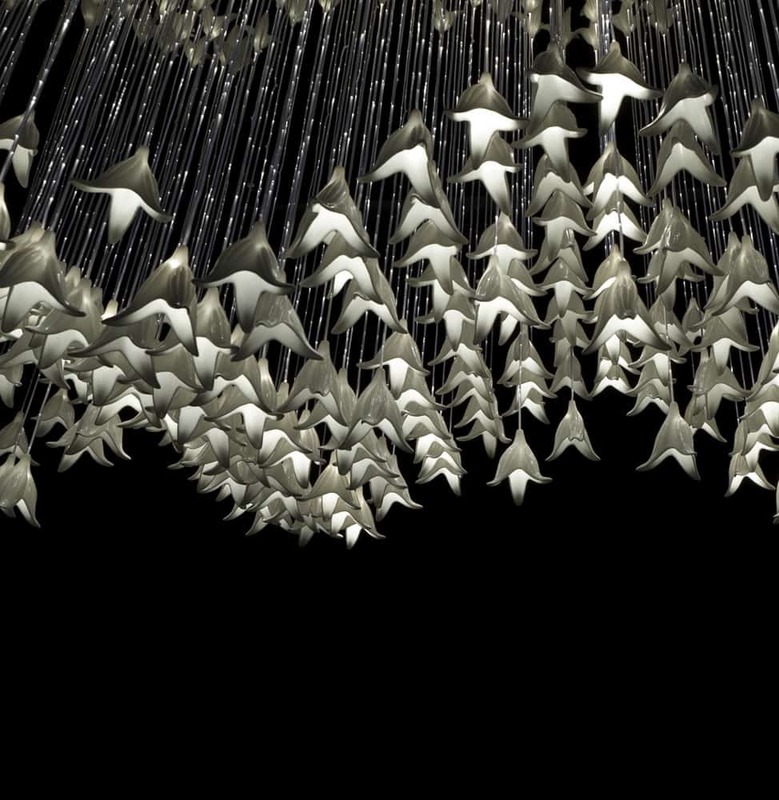 These designer lighting groups would be perfect choices for a minimalist modern loft. 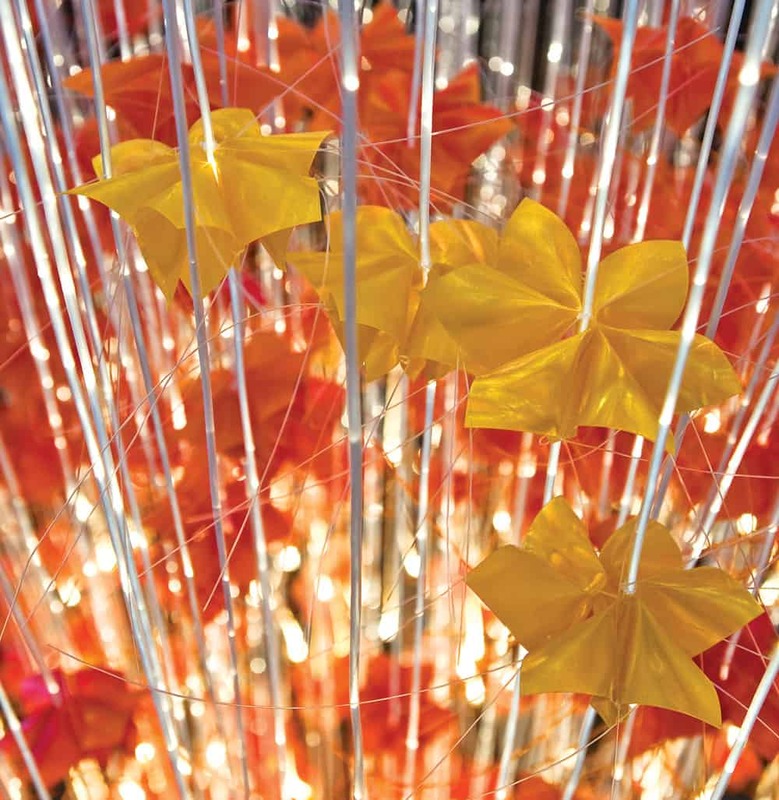 Floral shapes in warm autumnal colors – from vivid yellow to rich amber – give this designer lighting presence. 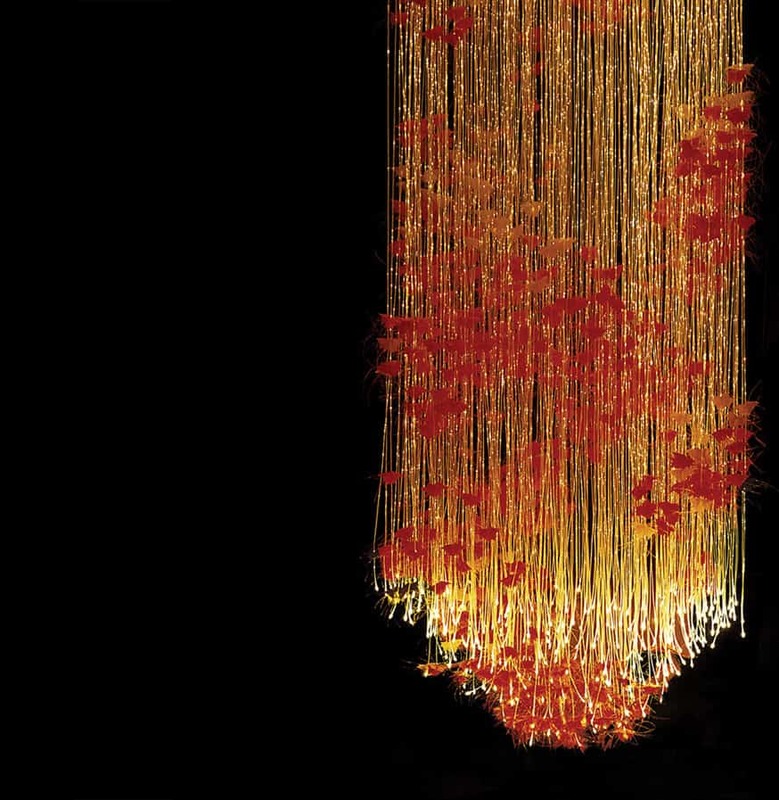 April/Autumn lighting in a private residence, New Delhi, India. 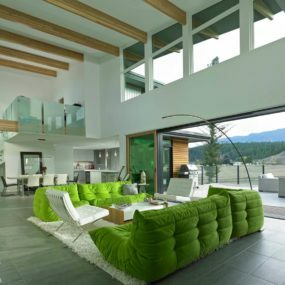 What a great conversation area. April/Autumn lighting at the Victoria & Albert Museum, London, UK. The vibrant fall colors are so cheerful. 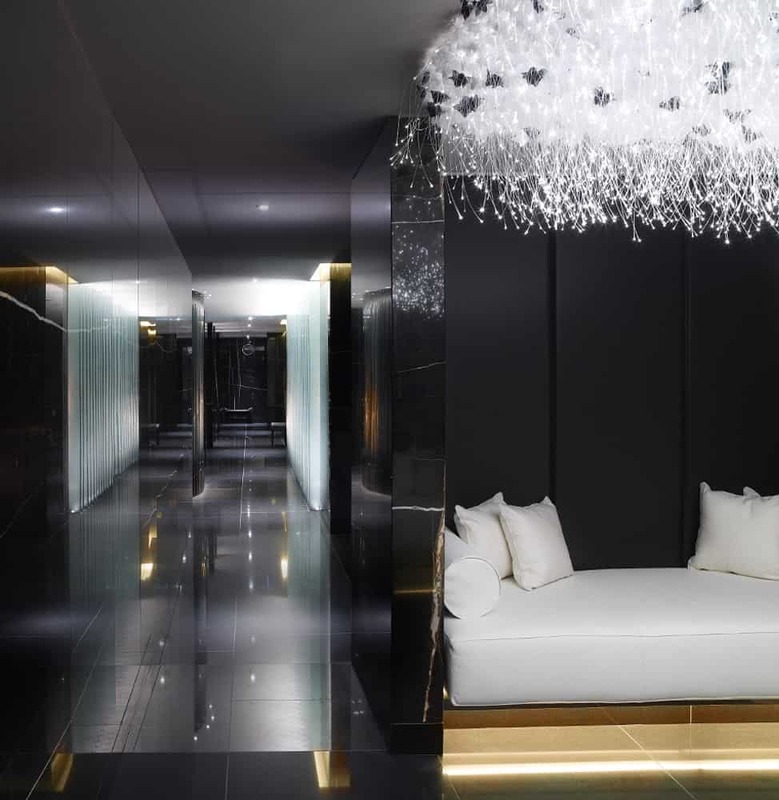 This April/Autum lighting fixture was created for the lobby of the Hilton Warsaw, in Warsaw Poland. There are four lights in shade of berry, rose and frost white, each dropping almost 33 feet. 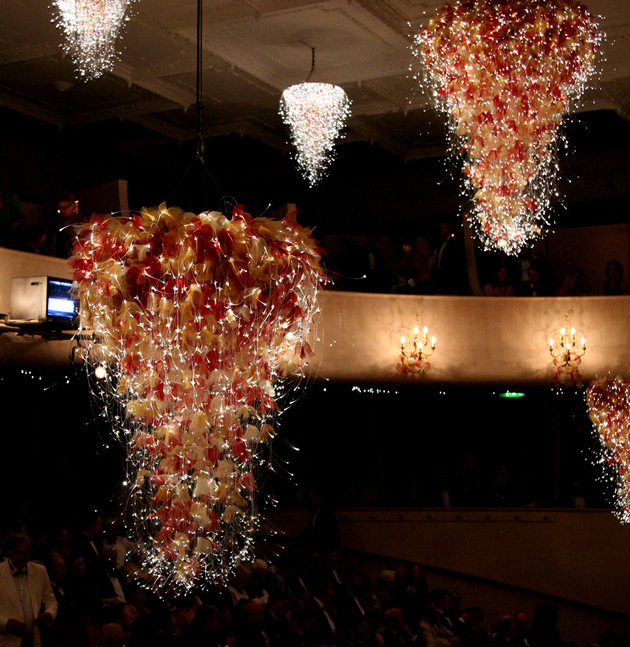 Now, that’s a light show. 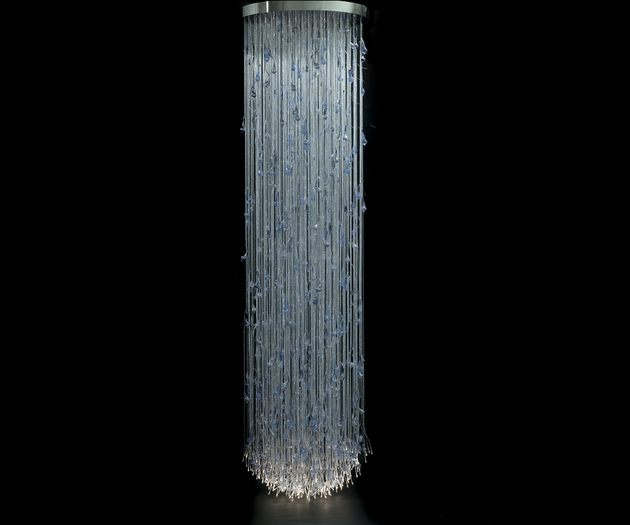 Hand blown glass, mirror polished steel and glass fibers create the Azure light. 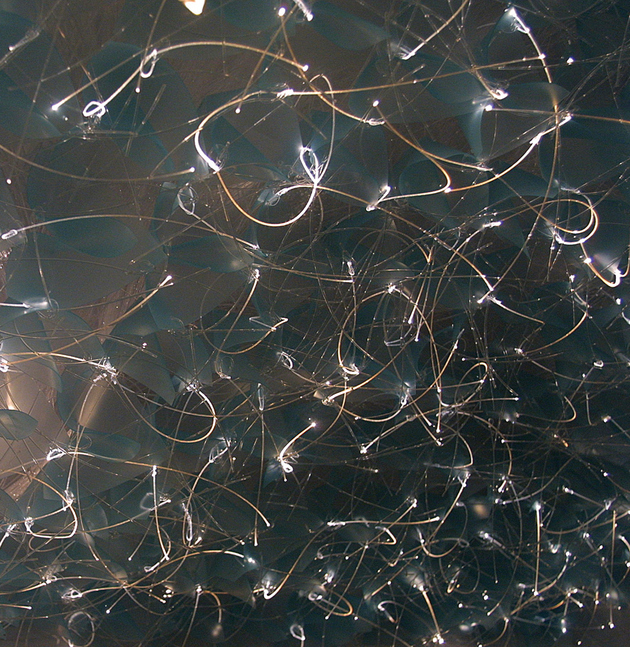 Hand blown glass droplets in iridescent blues hang from glass fibers in this light fixture. 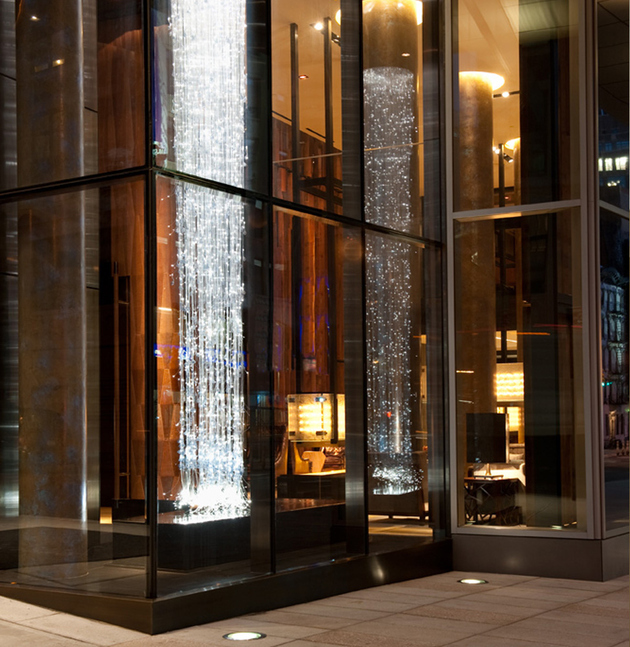 Azure lighting fixtures, entrance, Trump Soho Hotel New York, USA. They look like cascading waterfalls of fairy lights. 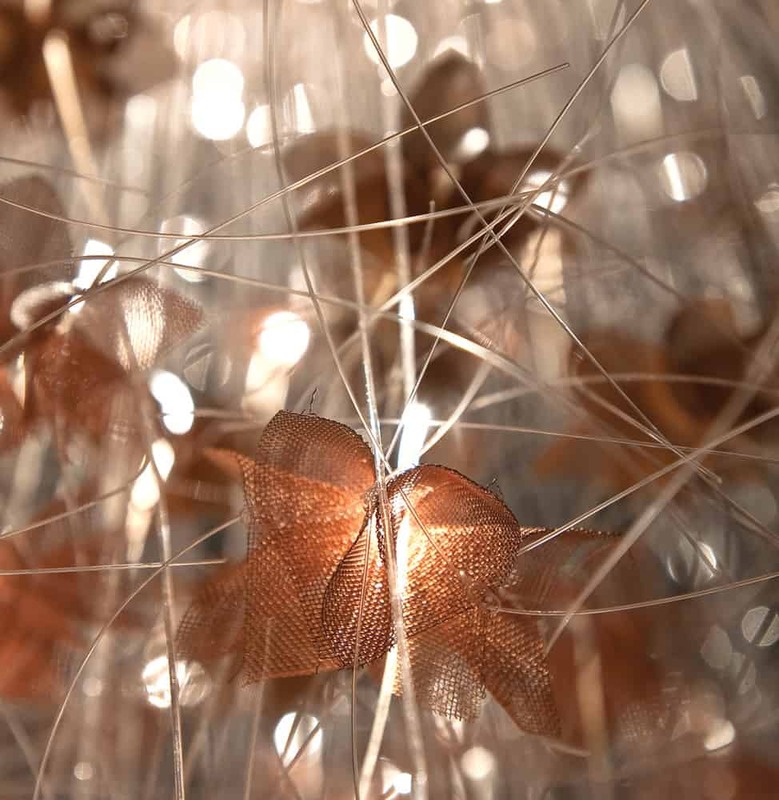 Bella lighting is created with woven copper, brushed copper and fiber optics. 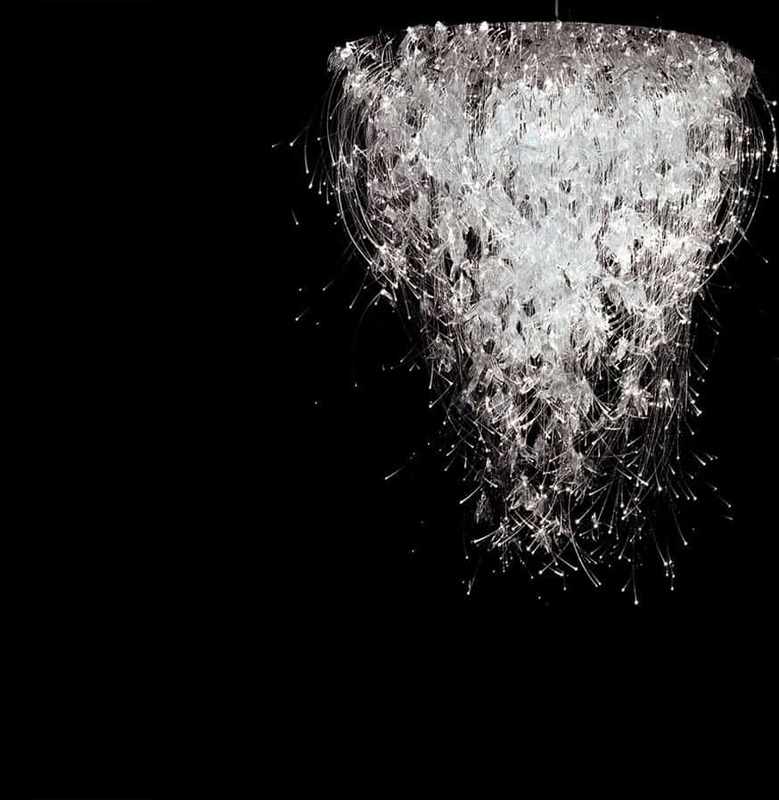 There is something very mesmerizing about this fixture. This designer light’s copper mesh shapes glimmer under the lights. 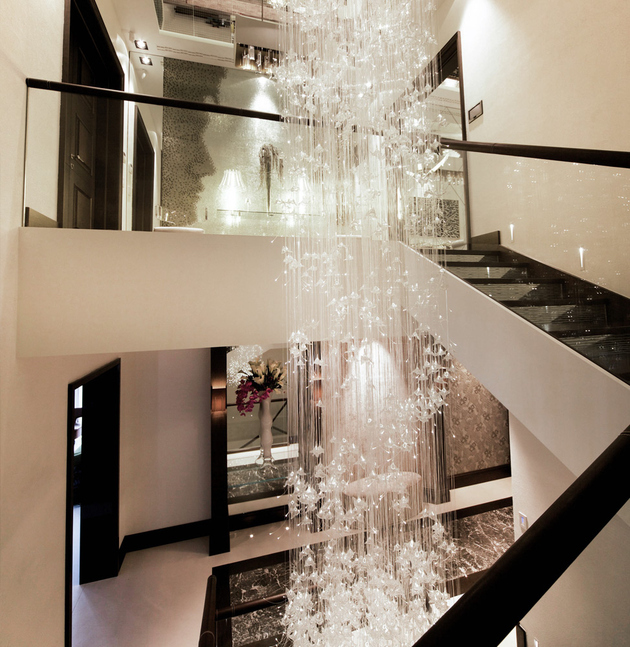 Bella lighting, private residence stairwell, London, UK. 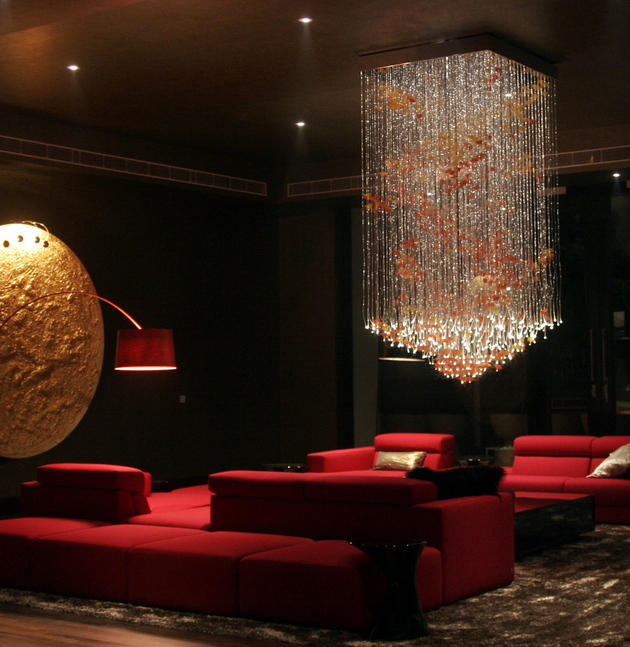 Bella lighting, custom, private residence, Spain. It certainly makes a statement piece in this modern home. 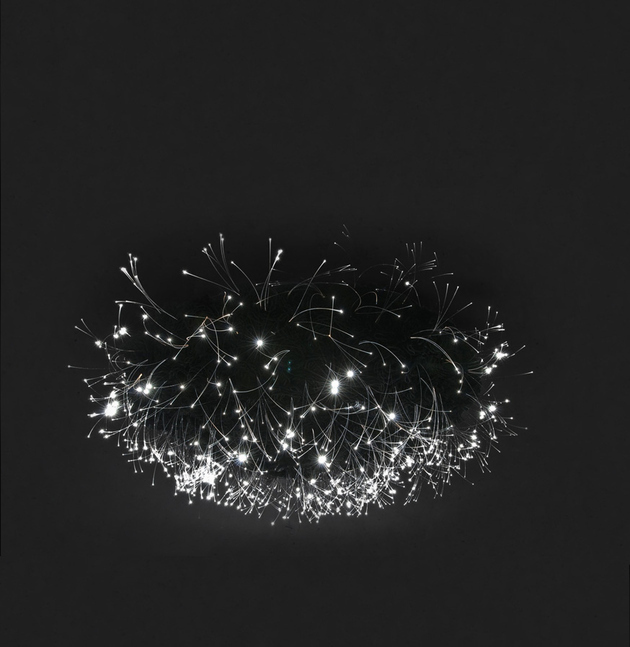 The Brielle lighting fixture is made from woven stainless steel, mirror polished steel and polymer end emitting fibers. They really look like flowers, don’t they? Twinkling fiber optics shine through blooming woven mesh flower petals in this designer light. 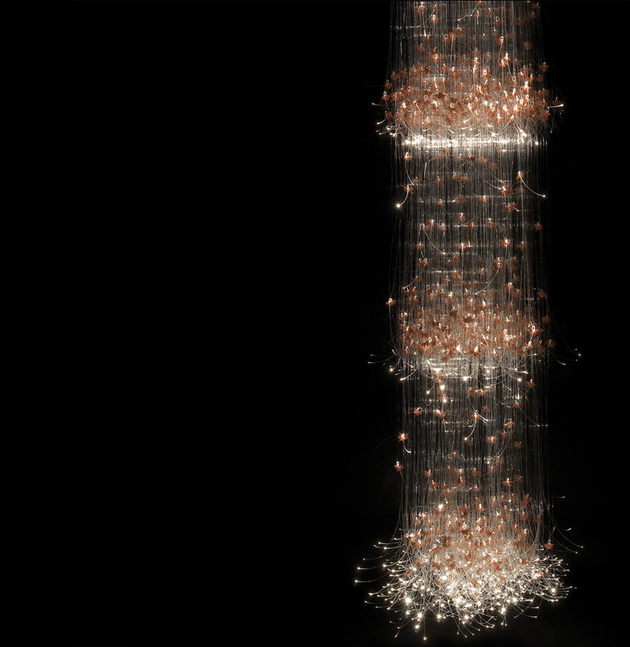 DuJardin lighting is made of bone china, mirror polished steel and glass side emitting fiber optics. 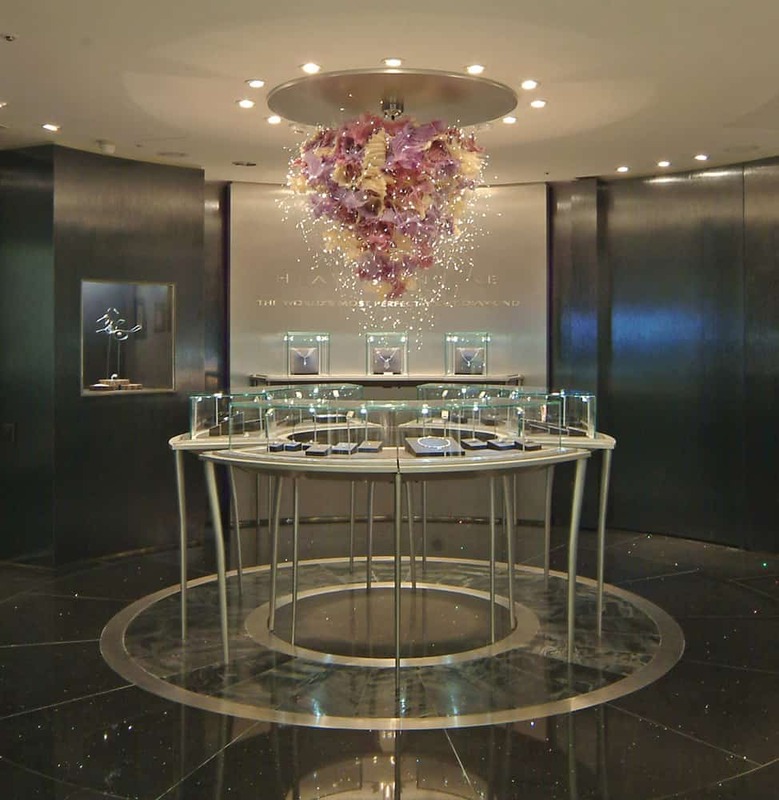 Don’t they look like Lily of the Valley blossoms? 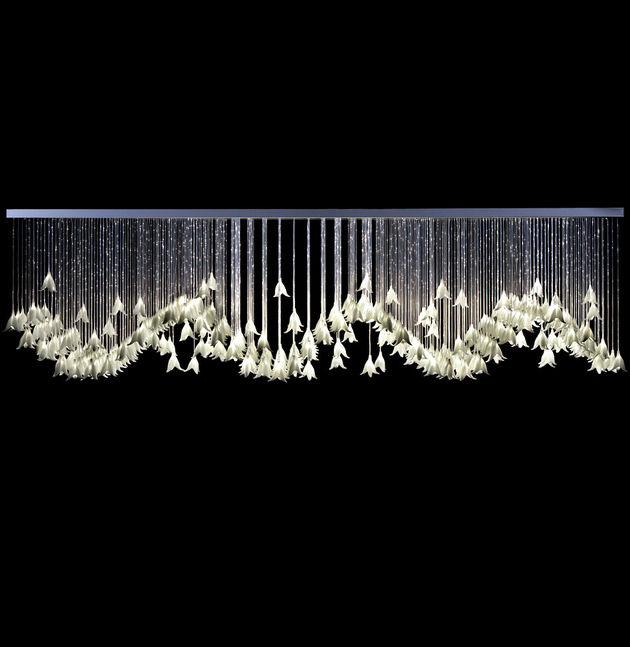 With the DuJardin light, white bone china bell shapes create a garden of light. 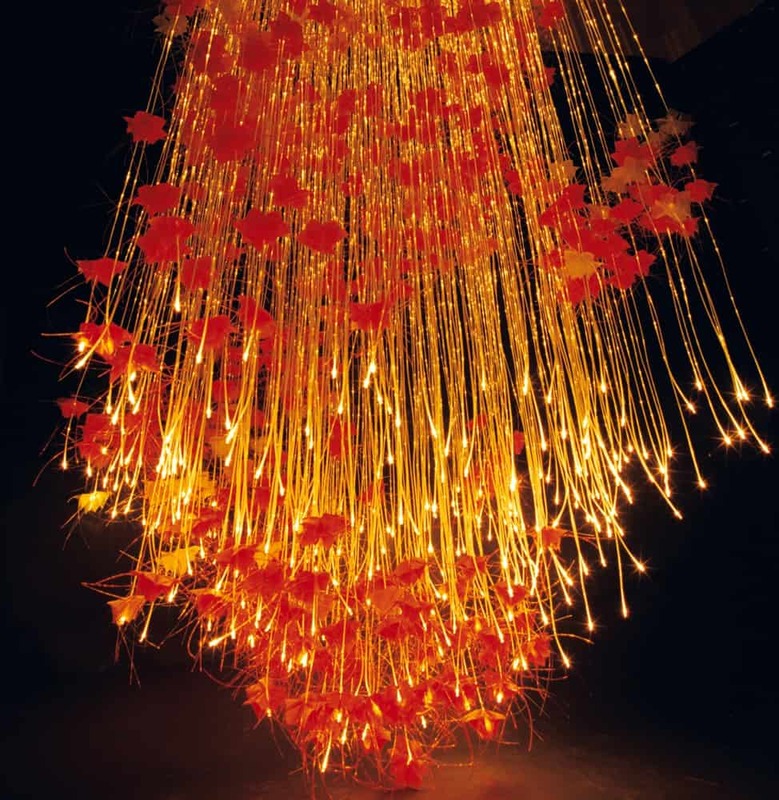 Filament lighting is an artistic expression of fiber optics. 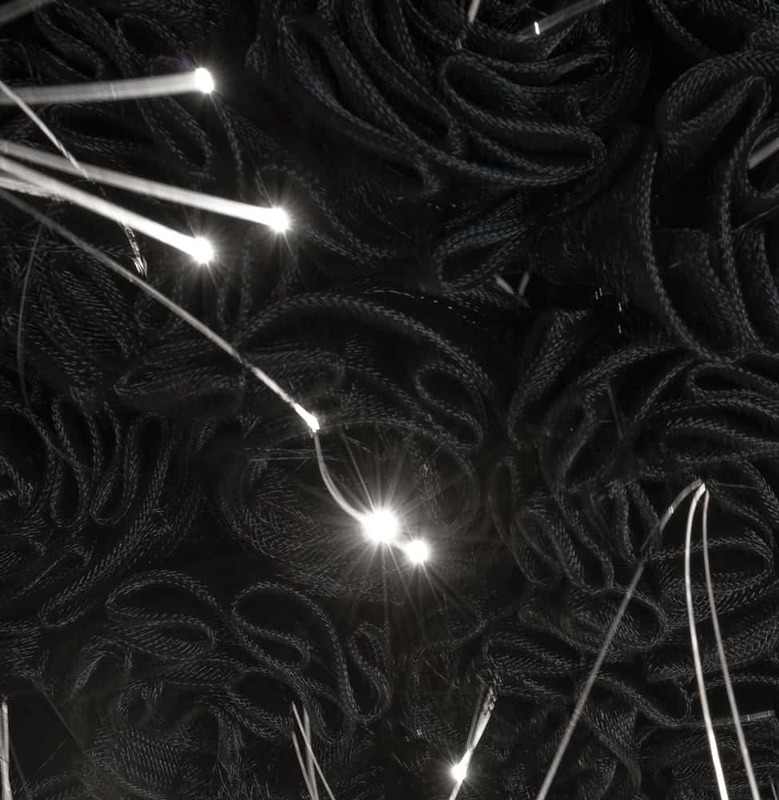 It features hand formed twisted shapes in a tangle of knotted and cut fiber optic filament. 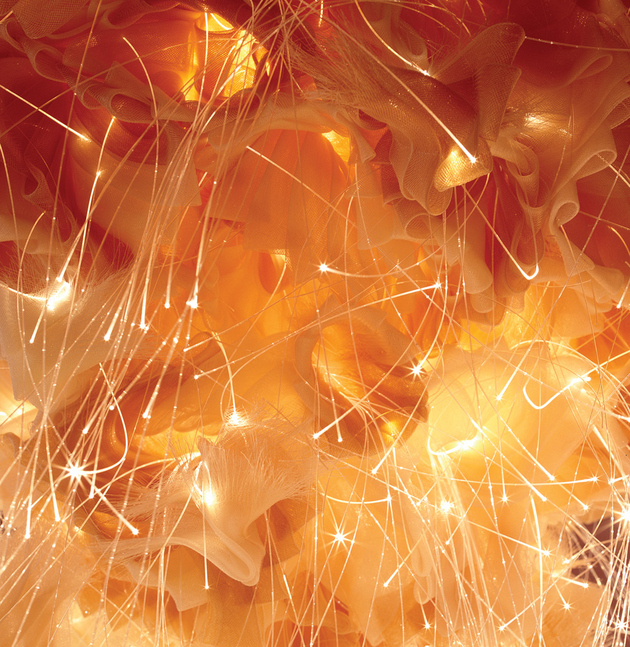 The Filament light is alive with color and glittering light. 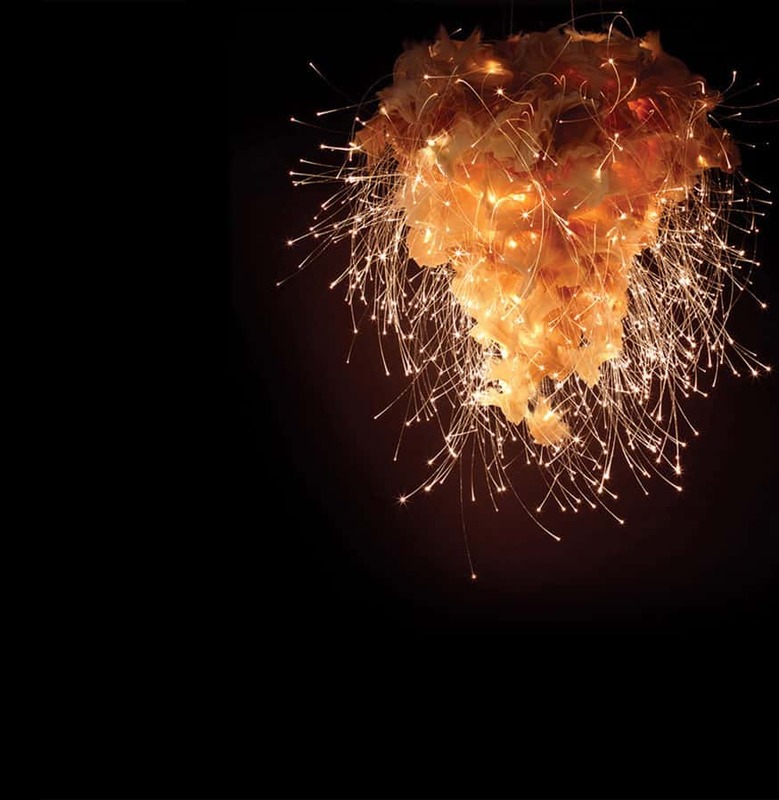 It has an intriguing composition. 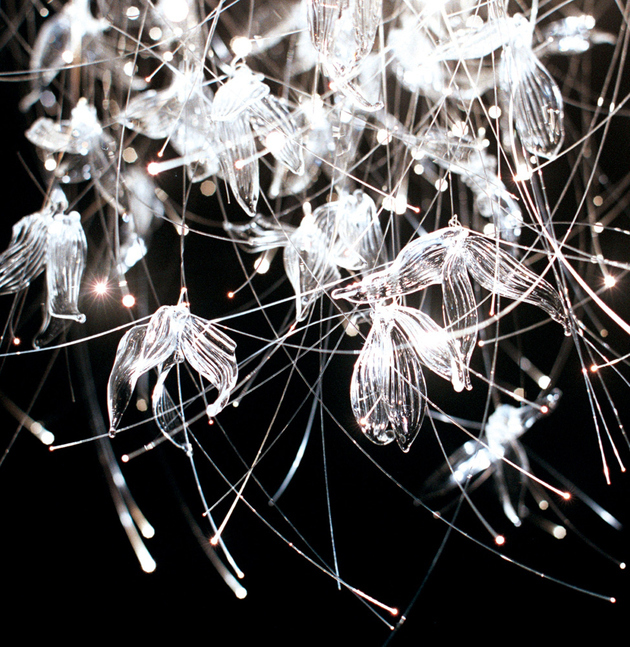 Flight lighting has a weightless and ethereal quality, mixing fiber optic filament with woven polymer. 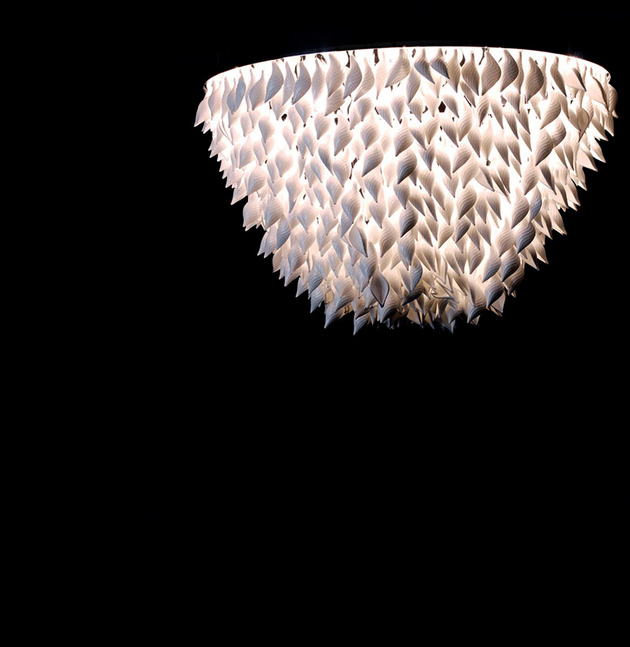 This lighting has a feathery air with it’s glowing knots and pinpoint speckles of light. Flight light, Crockford Club, London, UK. 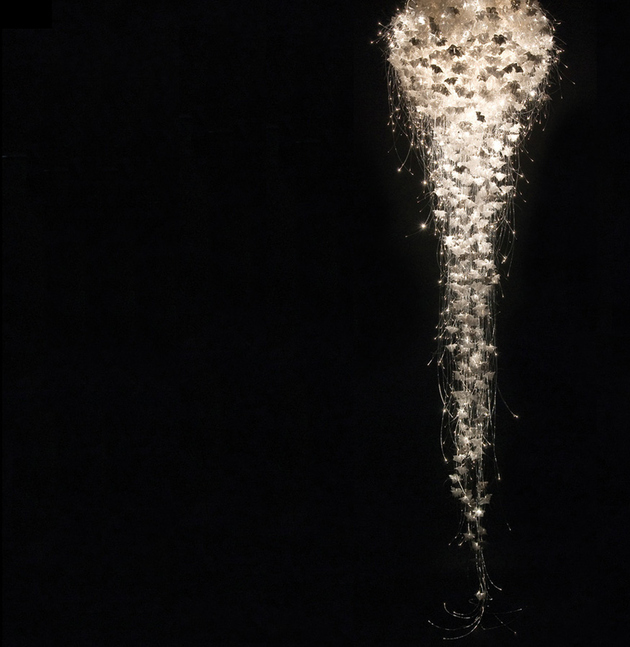 The elegant Ghost light is made from hand blown glass, mirror polished steel and polymer end emitting fiber optics. Ghost features bell-like glass shapes whose surfaces glint under the light. 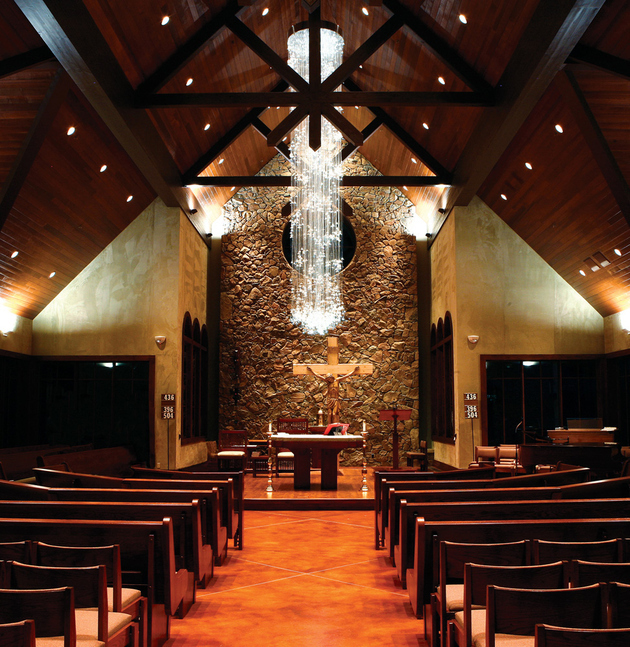 Ghost lighting, Our Lady of the Snows Church, Sun Valley, ID. The lighting looks very ethereal in this setting. 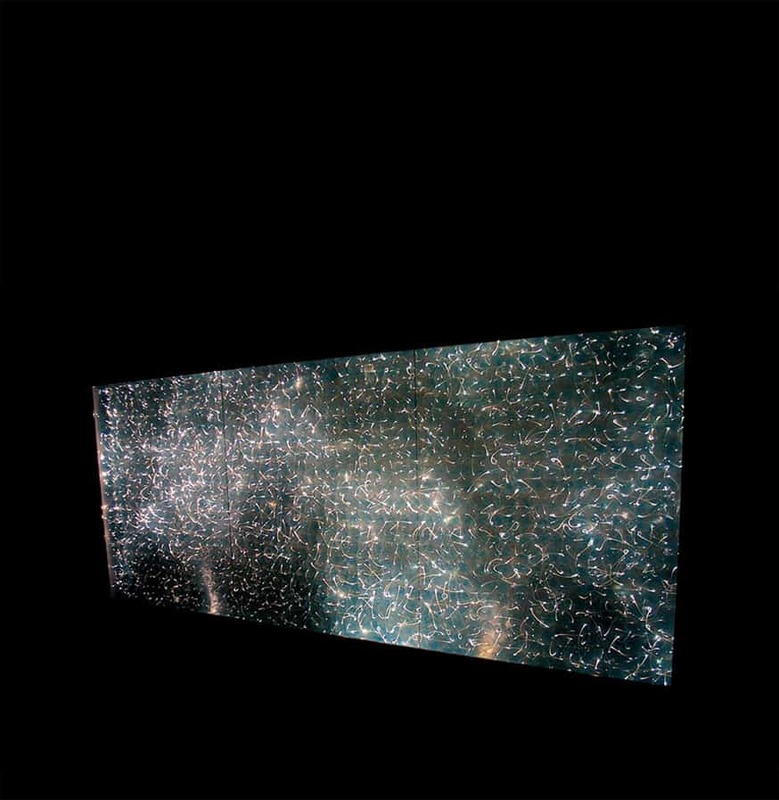 Ghost lighting, private residence, Croatia. 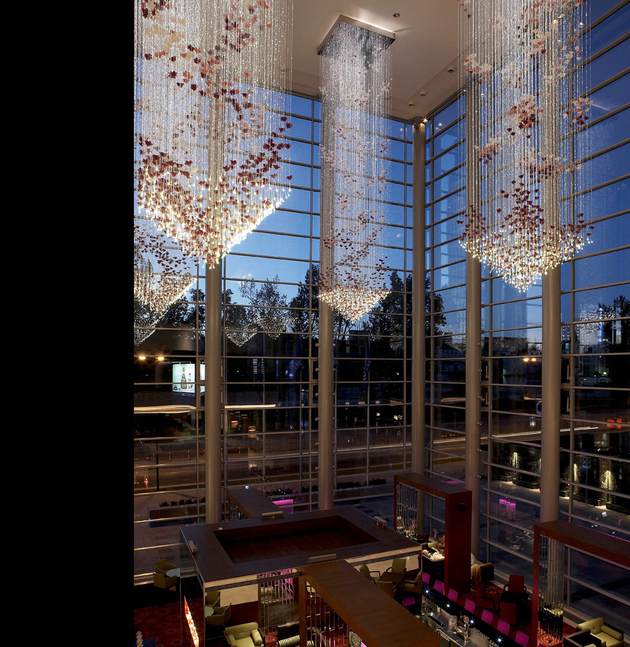 Flora Cascade lighting showcases the Sharon Marston signature shape, creating an explosion of light and texture. Flora Cascade lighting is available in a range of materials, colors and finishes. 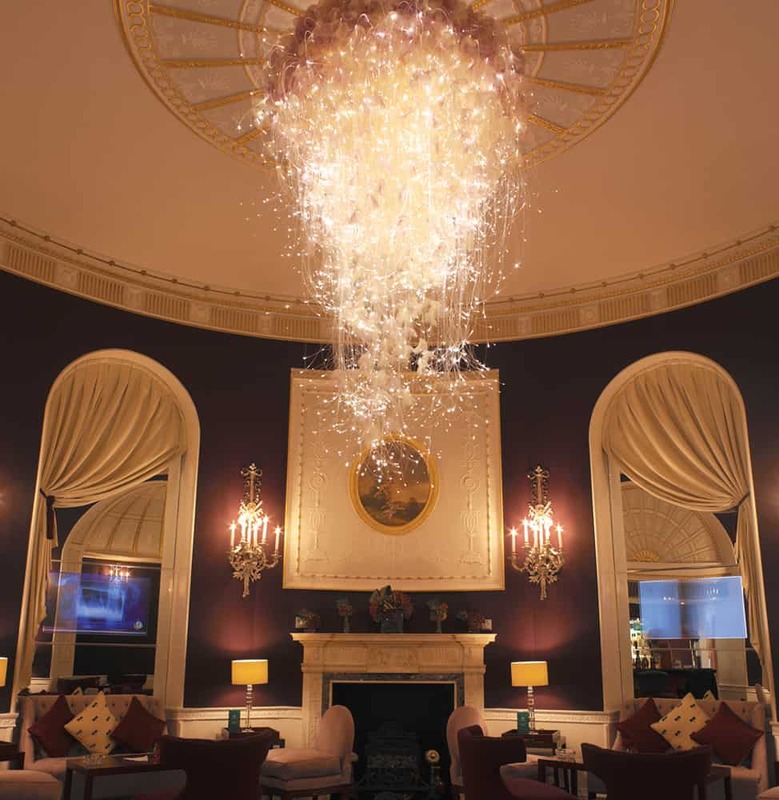 Flora Cascade lighting chandelier, Corinthian Hotel, London. 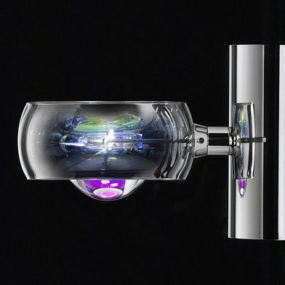 The Iona light fixture – made from bone china and mirror polished steel. Long flowing strings are gathered in the center of the piece to create a cascading rosebud formation. 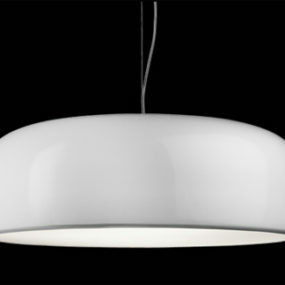 The Iona light is back-lit using halogen capsules behind white lacquered bone china. Laelia designer lighting is and blown glass and chrome with polymer end emitting fiber optics. The polymer end pieces really make it appear that the pinpoints of light are suspended in the air. 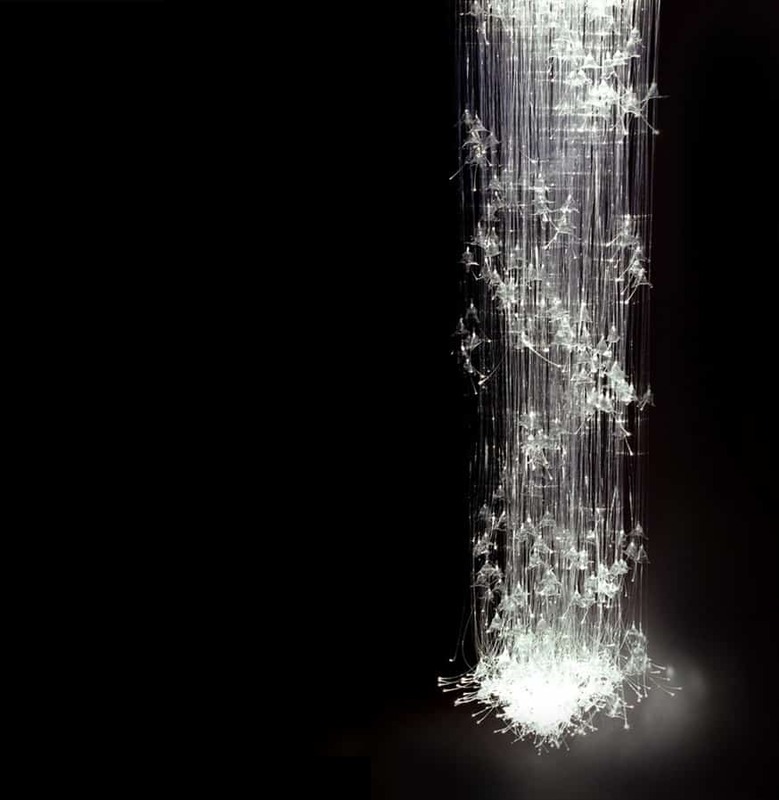 Laelia lights are created from delicate leafy shapes suspended with a fiber optic filament. The Laelia light, at Bellevue Towers, Bellevue, WA. The Laelia light, commissioned for a James Bond retrospective, is comprised of over 6,000 hand blown pieces. This spectacular chandelier forms an integral part of the exibit: Designing 007: Fifty Years of Bond Style at the Barbican Center, London, UK. Shown in The Casino Room. 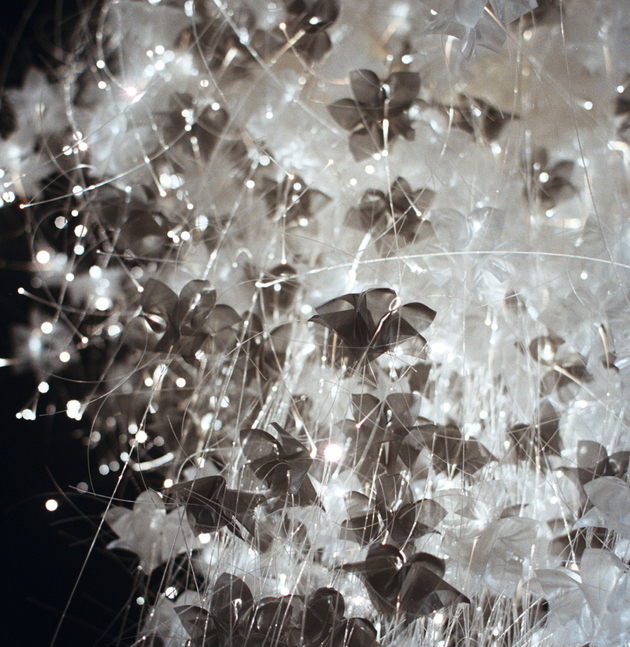 The Laelia, at Grange Park Opera House, Alresford, UK. 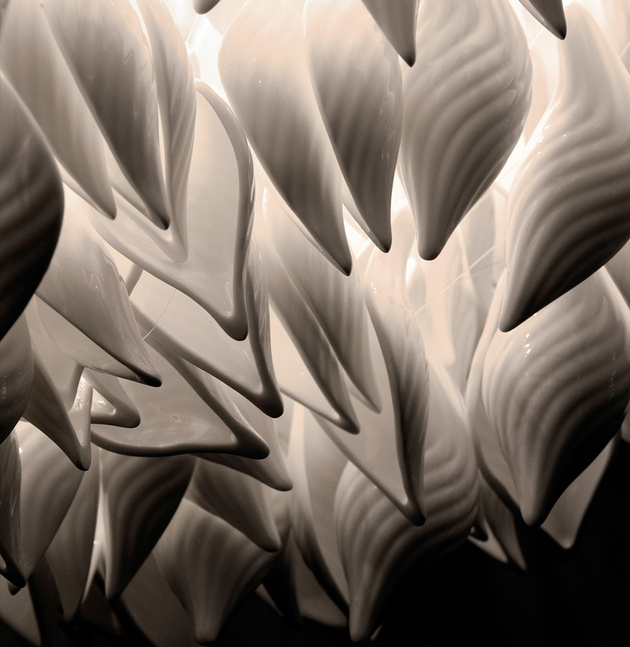 Pleated and sewn coils of nylon make up the body of this Pleat lighting. It is the lengths of brilliant filament that give Pleat lighting its pizazz. 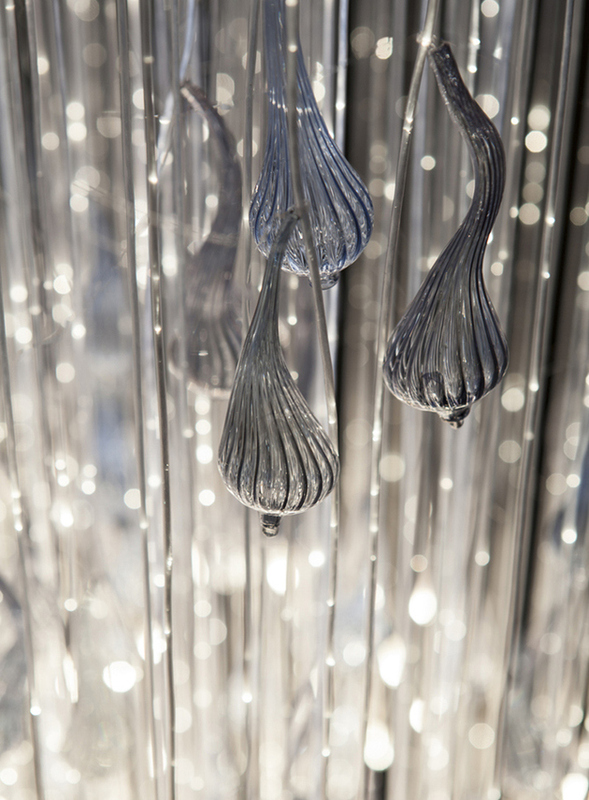 Pleat lighting, Jewelry Boutique, Taipei, Taiwan. The Ruche lighting piece sees filaments gathered and swirled into this opulent piece. Ruche lighting color choices cover a wide array of colors for creating a custom lighting fixture. 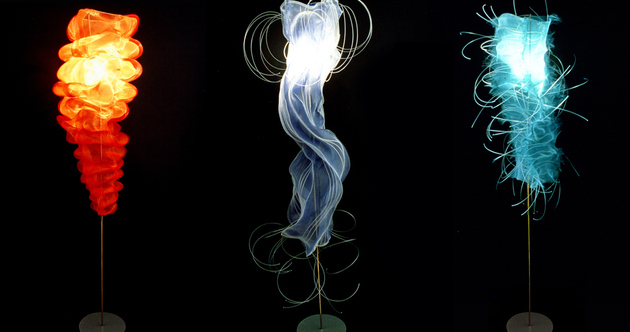 And we close with a lighting twist – floor lamps by Sharon Marsten. 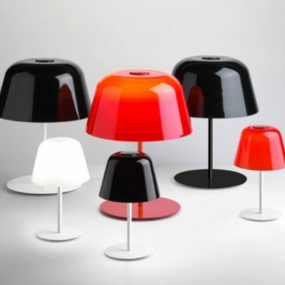 These floor lamps were part of a previous collection for Liberty, Le Bon Marche and other retail outlets. This lighting designer is truly versatile, isn’t she? 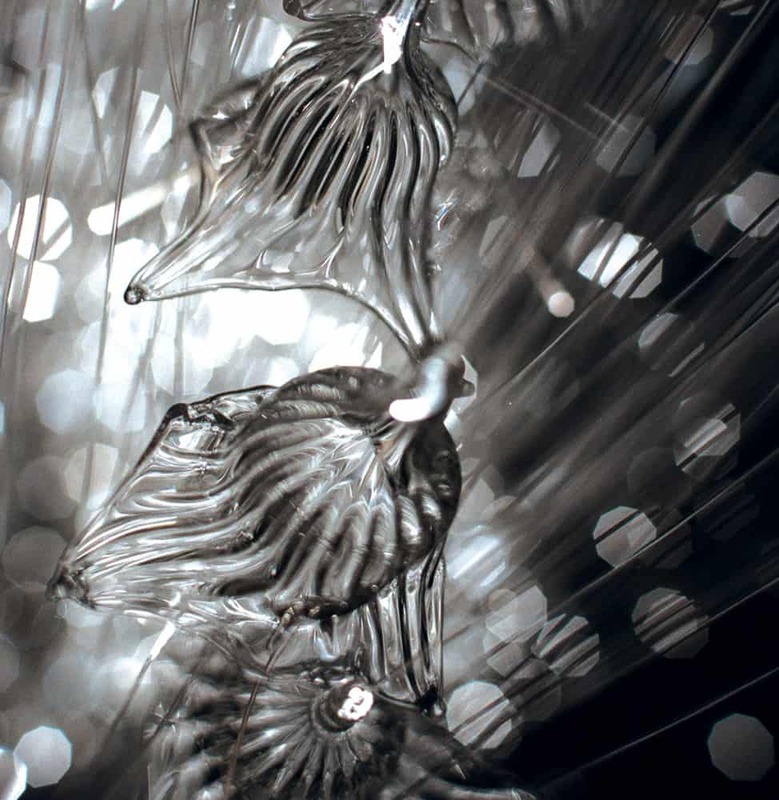 For more information and to see all of Sharon Marsten’s work, please visit her website. 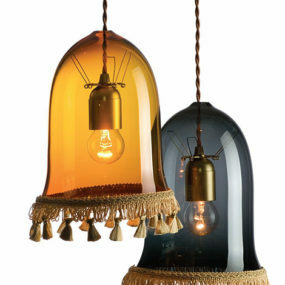 And be sure to check out our 25 Coolest Hanging Lights for Modern Rooms. 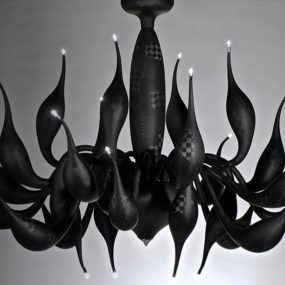 If you like this stunning designer lighting collection you may also like our selection of amazing chandelier designs. 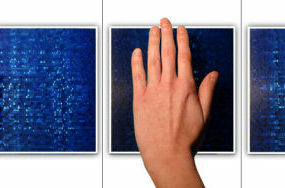 SensiTile fiber-optic tiles – where the light moves!